Seneca famously said, 'Time discovers truth', and with the recent evolution of time clock technology, his quote becomes even truer! In fact, if Seneca was aware of the emerging success of time clock software, he might have rephrased his statement to say, 'time clocks discover truth'. The role of a time clock is to record the hours that employees spend in a particular place, or at a particular activity, which is necessary when workers are paid at an hourly rate. Traditionally employees used to 'clock in' to work by inserting a piece of card into a machine, which would punch or stamp the card indicating the time that the employee arrived and left their place of work. Over time, and with developments in technology, this system evolved into individualized swipe card systems, which were often linked into time management software, payroll accounts and other administrative systems. Time clock software, however (sometimes referred to as 'Punchclock Software'), takes the concept of simply 'clocking in' a huge leap forward. Employers can electronically track and report employee attendance in such detail that even shift and departmental performance can be monitored with total accuracy. An effective time clock system can even isolate and manage individual employee status, in order to prevent employees manipulating their working hours by creating timesheets in advance or by having other employees clocking in on their behalf. So Seneca might say that a time clock discovers the truth! The benefits go further; time clock software can accumulate employee data into a database to provide the business managers with easy access to the information, with complete confidence in its accuracy. Paperwork and human errors are minimized as information is handled by a viable and fully integrated system. 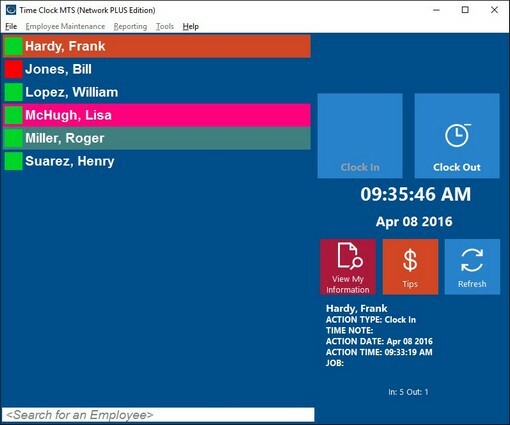 Time clock software can be used to ensure that workers are paid fairly. In this sense, it contributes towards satisfying the demands of local payroll regulations, whilst meeting the company's payroll criteria. Disputes over pay can be minimized, as detailed reporting of time keeping and attendance can be produced clearly and quickly. In providing information, over a range of areas appropriate to business administration, time clock software can provide a valuable service for both the company and its employees. The time clock serves to protect the interests of the employee, as much as those of the employer, by ensuring that employee's hours are fairly calculated and so that they are paid fairly and appropriately. In this respect, it is not difficult to obtain the support of the employee when implementing new time clock technology. The many applications of time clock software make it a very worthwhile addition to the administrative systems of any business. Time clock software is used effectively by small businesses as well as large conglomerates, saving a great deal of human administrative work, which is often time consuming, expensive and prone to errors, and providing accurate reports and records, serving the best interests of all parties concerned in contributing to a successful business.